JCC Chicago’s Outdoor Shabbat and Holiday Program successfully engaged families in unique Jewish experiences that bridged the connection between Judaism and the environment. 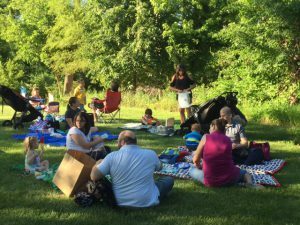 Taking advantage of the warmer months in Chicago, the Outdoor Shabbat and Holiday Experience took place at the Lake County JCC, which is located on 37 acres of lush land, and encompasses nature trails, protected marsh lands, expansive fields, and the renowned Garoon Gateway to Science. The Outdoor Shabbat and Holiday Program inspired the connection and responsibility that the Jewish people have to the planet and provided an opportunity for the Jewish community to be surrounded by nature, take walks through the wetlands and marshes, and celebrate under the stars.